Is blockchain going to be introduced in voting and election? We shouldn’t be surprised if it happens. We are heading towards a future where cash or paper base currency is to be replaced by Bitcoin or cryptocurrencies. In this scenario, seeing blockchain in election and voting terms, both in corporate and politics, seems quite relevant. Being the continuation of the Blockchain Week at yourtrainingedge.com, this article discusses the blockchain implementation and use in this regard. In principle the electronic voting machines (EVMs) must not be demonized. Their idea also hits efficiency and avoidance of human error or tampering. However, the EVMs are also not innocent. An average user has just no clue how they are run or that they can make, or be made to make errors and mistakes, just like another piece of computing equipment. For those who are more technology savvy, the problem is not the lack of knowledge and understanding of this technology, but the transparency and access, since usually EVMs utilize proprietary software. Until the codes are made open-sources, there should not be any electronic voting machine, critics say. Enabling the private businesses to count votes with the secret programs is only stupid and also anti-democratic. Paper card stock ballots that can be counted by machines are fine, since they can be hand counted again in order to verify the accuracy of the machine count in close races. The case of US is specifically problematic. A year ago, no one of people talked to predict that there would be a big meltdown of fall, or even most, of the voting equipment of nation in 2016. Aging machines, not all, are failed at once on a single day. However, many people argued that unless equipment is replaced we will be increasingly observing the problems from these aging equipment that have already been happening more frequently, leading to flipped votes, shut downs, frees, long lines and lost votes and erroneous tallies, as a worst scenario. It is against this backdrop that the blockchain entrepreneurs have begun to develop their own solutions, and the blockchain technologies corporation (BTC) is one of the businesses that advanced the most in this arena. As per the latest blog post by the company, the voting machines presently used in the elections in the US are insecure, out of date, hard to use and mostly provided by a single vendor whose vote-counting software is proprietary. 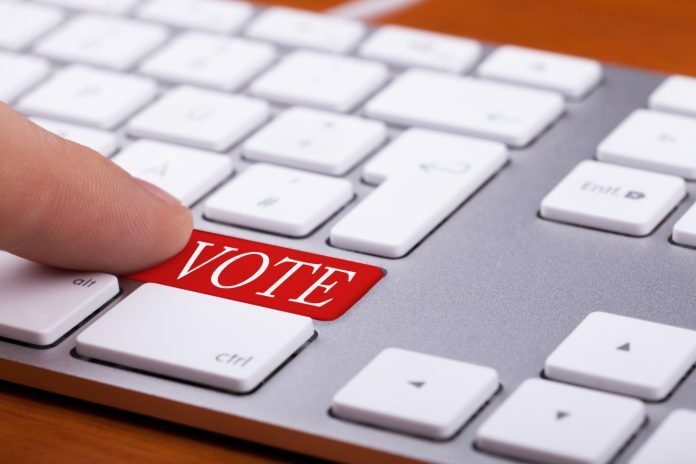 The BTC’s solution involves a paper ballot that carries a unique identifier, an especially designed machine that scans the ballot offline and burns the data on a DVD, and a blockchain where the results are permanently recorded. What BTC has been particularly successful in is gaining experience. While the first ever political party to use blockchain-based e-voting was the Danish Liberal Alliance, which conducted an internal vote on 22 April 2014 during its annual meeting, the Libertarian Party in the US has recently employed BTC services on at least two occasions. Apart from the political field, the same is seen in corporate, where blockchain voting for the shareholders is to be used. Nasdaq is using the technology that underpins bitcoin – the blockchain – to allow international residents of Estonia vote in shareholder meetings even when they’re abroad, in a test that could have wider implications for the adoption of the technology. Estonia offers e-Residency which is a transnational digital identity available to people who start a business online in the nation. But if those people own stock in an Estonian publically listed firm, they need to be physically present to vote in shareholder meetings or nominate someone else to do it for them, an arduous process. But the Nasdaq, using blockchain technology, is hoping to change that. Blockchain, as we discussed earlier also, works like a big decentralized ledger for digital currency bitcoin that records and saves all transactions and their information on a global network, to avid tampering. This is the technology Nasdaq has tried to apply to its shareholders votes. In addition, a number of banks are also planning to use the same. In future, the blockchain voting might become the norm of the industry, we can say.